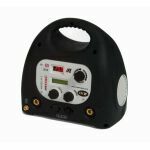 The Fusion HF and PHF models offer the professional the ultimate choice in DC HF TIG welding inverters. Easy to set up, the software driven units incorporate a LCD display allowing welding output parameters to be quickly selected. Once the required function is displayed in the LCD window, rotating the large 360 deq encoder control knobs quickly performs any required welding parameter adjustments. Post flow gas time, HF or Lift arc start, slope out time, 2T & 4T torch switching options, together with remote current control functions are standard features in the multi choice menu. 110 volt models require a 110 volt mains supply or 5kva transformer. Supplied complete with genuine Binzel SR26 air-cooled 4 metre TIG torch (Part number TIGKIT26) with handle mounted on/off switch, plug and accessory kit, 5 metre gas hose with nuts and tails and a 5 metre long earth lead with earth clamp and DIX plug.